The Conference Board of Canada plagiarism and undue influence story - which with the Board's report and overdue apology to Curtis Cook will now go on hiatus until new reports are issued in the fall - has obviously attracted considerable interest. Looking back, while plagiarism is rare, it is the public airing of the copyright lobby policy laundering effort that is the far more important development. Although there are many groups involved in copyright lobbying, at the heart of the strategy are two organizations – the Canadian Recording Industry Association and the Canadian Motion Picture Distributors Association. CRIA's board is made up the four major music labels plus its director, while the CMPDA's board is comprised of representatives of the Hollywood movie studios. Those same studios and music labels provide support for the International Intellectual Property Association, which influences Canadian copyright policy by supporting U.S. government copyright lobby efforts. 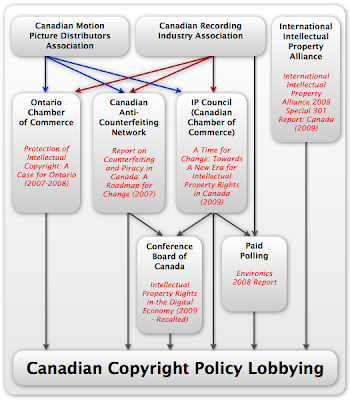 In addition to their active individual lobbying (described here), CRIA and CMPDA have provided financial support for three associations newly active on copyright lobbying – the Canadian Anti-Counterfeiting Network, the Canadian Chamber of Commerce's IP Council, and the Ontario Chamber of Commerce (there are other funders including pharmaceutical companies and law firms). Those groups have issued virtually identical reports and in turn supported seemingly independent sources such as the Conference Board of Canada and paid polling efforts through Environics. Establish an Intellectual Property Rights Coordination Council consisting of senior government officials, representatives from the business community, and IP rights holders. The Council should develop and implement a robust IPR framework that promotes the creation and exploitation of innovative products and services in Canada. IP Inter-ministerial coordination council: comprising high-level representatives from the IP sector; would create policy programs to promote the protection of IP; would enforce key elements such as exposing the dangers and risks to consumer health and safety, highlighting the relationship between IPR crime and organized crime, providing information and resources to SMEs, and creating programs to exploit IPR. Establish a specialized IP Crime Task Force to guide, coordinate and lead anti-counterfeiting and anti-piracy enforcement efforts in Canada. IP Task Force: comprising individuals dedicated to IP-related crime; would coordinate enforcement and prosecution activities against counterfeiters and pirates; would work with CBSA to track counterfeit products. Create public education and awareness programs creating and implementing educational programs, with emphasis on Canadian youth, that teach the rationale for and importance of intellectual property Private and public sector stakeholders should work in partnership with consumer protection groups and education institutions to generate greater public awareness of the impact of counterfeiting and piracy on public health and safety, as well as to the economy Establish an intellectual property education program targeting the public, businesses, innovators, creators, and government officials. Private and public sector stakeholders should work with consumer protection groups and academia to generate awareness of the impact of counterfeiting and piracy on public health and safety, as well as to the economy. authority and resources needed to target, detain, seize and destroy counterfeit and pirated goods on its own initiative. Federal and provincial governments should provide additional funding and training to all relevant enforcement authorities for enhancing IPR protection. IP Council It has been conservatively estimated that counterfeiting and piracy cost the Canadian economy $22 billion annually in lost tax revenue, investment and innovation. Royal Canadian Mounted Police. “Intellectual Property Rights Crime.” Presentation. Montreal. Sept 16, 2008. IP Council According to a study commissioned by the Business Software Alliance (BSA), losses to the Canadian economy due to software piracy surpassed $1 billion in 2007.
Business Software Alliance. News Release. “BSA Urges Stronger Copyright Legislation To Reduce Impact of Piracy on Canadian Economy.” May 14, 2008. 3. Losses Due to Film Piracy (see my post on movie industry losses here). CACN The annual consumer spending loss in Canada due to film piracy in 2005 was estimated at approximately $270 million, while the loss of tax revenues due to film piracy in Canada in 2005 was estimated at approximately $41 million The Canadian Motion Picture Distributors Association (CMPDA) Beyond Borders: An Agenda to Combat Film Piracy in Canada (Beyond Borders) 2006. Ontario Chamber The annual consumer spending loss in Canada due to film piracy in 2005 was estimated at approximately $270 million with a loss of tax revenue accruing to an estimated $41 million The Canadian Motion Picture Distributors Association (CMPDA) Beyond Borders: An Agenda to Combat Film Piracy in Canada (Beyond Borders) 2006. IP Council Film piracy resulted in consumer spending losses of approximately $270 million in 2005, as well as tax revenue losses of $41 million The Canadian Motion Picture Distributors Association (CMPDA) Beyond Borders: An Agenda to Combat Film Piracy in Canada (Beyond Borders) 2006. CACN As a result of the combined impact of the physical and online black markets, the Canadian music industry’s retail sales of pre-recorded CDs and cassettes declined by 48 percent ($637 million) from 1999 to 2006. The Canadian Recording Industry Association, Press Release, March 2, 2006. Ontario Chamber The Canadian music industry’s retail sales of pre-recorded CDs and cassettes have declined by 44 percent from 1999 to 2005, a decrease of $541 million. As a result, the Canadian recording industry has had to shed its workforce by 20 per cent, with most lost in Ontario The Canadian Recording Industry Association, Press Release, March 2, 2006. IP Council Canada’s music industry, faced with unchecked online counterfeiting and piracy, experienced a 48% ($637 million) drop in retail sales from 1999 to 2006. The Canadian Recording Industry Association, Press Release, March 2, 2006. CACN Piracy can only thrive in a culture where citizens view the acquisition of counterfeit goods as acceptable, thereby opening the way to consumer demand for those products. This appears to be case in Canada – particularly among youth – where research has found that stealing IP is increasingly regarded as morally acceptable. Ontario Chamber the OECD found in a December 2005 report that Canada had the highest level of peer-to-peer downloading among OECD countries. IP Council The RCMP has identified an “ever-growing use of the Internet for IP crime” in Canada, and predicted that the problem will escalate because “soft ware, music and movie piracy are easy, low-risk activities.” In November of 2007, the Quebec Superior Court declared that unauthorized file sharing in Canada was an “endemic” problem. Conference Board The Internet piracy problem within Canada continues to worsen and is causing serious problems for markets in other countries. Ontario Chamber Further, the United States Trade Representative (USTR) has stated that Canada’s lax border measures “appear to be non-compliant with TRIPS requirements” and the Canadian Anti-Counterfeiting Network has stated that “Canada has effectively failed to meet” its TRIPS obligations. IP Council Several international organizations and countries have specifically identified Canada for its failure to adequately protect IP rights. In March 2008, the International Intellectual Property Alliance placed Canada in the same league as well known counterfeiting havens like China and Russia by listing it among “countries of the greatest concern.” In April 2008, the United States Trade Representative (USTR) placed Canada on the Special 301 Watch List for the fourteenth consecutive year. Conference Board There is ongoing debate and outcry in Canada regarding the 2007 and 2009 Special 301 Reports issued by the Office of the United States Trade Representative. CACN By providing a marketplace where investments in creative goods and services will be profitable, IP protection fosters innovation, job creation and economic prosperity. In developed nations like Canada, where innovation has become a key economic driver, this has never been more important. Unfortunately, it appears that all levels of government in Canada lack a sophisticated understanding of the connection between innovation and IP. IP Council Canadian failure to properly protect IPR directly affects the willingness of foreign firms to invest domestically. Conference Board Canada is not among the top innovation nations, but is well positioned to do better if it can bring together its fragmented and uncoordinated innovation infrastructure. Otherwise, Canada will continue to offer only a marginal framework for developing and exploiting intellectual property from both the private and public sectors. The role of intellectual property systems in Canada has received inadequate attention. If Canada does not change, its economic outlook will suffer. It is not just that these reports all receive financial support from the same organizations and say largely the same thing. It is also that the reports each build on one another, creating the false impression of growing momentum and consensus on the state of Canadian law and the need for specific reforms. Consider the IP Council's A Time for Change, which was released in early 2009. The very first chapter of the report is titled "Canada's Emerging Consensus on Intellectual Property Rights." Where does this consensus come from? According to the IP Council, it starts with the CACN report, followed by two House of Commons committees that heard primarily from these groups and which led to the 2007 Speech from the Throne and Canada's participation in ACTA. The chapter then states that IPR policy was taken to the "next level" with the Ontario Chamber report, the founding of the IP Council, and the 2008 Conference Board of Canada conference that led to the three recalled IP reports. The chapter then notes the "growing public awareness of the need for action" which cites Environics polls (paid for by the IP Council) and a Toronto Star supplement on counterfeiting (paid for by the CACN). In all, the IP Council cites the CACN four times, the Ontario Chamber twice, the Conference Board of Canada proceedings 13 times, and the Environics research five times. over the past several years Canada has fallen behind the international community when it comes to the protection of intellectual property and products of the mind. The gap between Canadian laws and international standards in the area of counterfeiting, piracy, and illegal downloading is growing ever wider. Canada has been maintained by the U.S. Trade Representative on a special watch list specifically because of its laxity in the realm of protecting intellectual property. What makes the timing particularly noteworthy is that even though Environics issued a press release claiming that the data came from a new study, the data was not new. Rather, it was drawn from a 2006 survey that seemingly sat idle for two years until the opportune moment to raise it days before the introduction of new copyright legislation. Who funded the questions related to intellectual property? It will come as little surprise to find that CRIA paid for those. Moreover, Environics oddly proceeded to re-issue the identical press release six months later (June 2008 version, December 2008 version) in conjunction with an IP Council commissioned survey on counterfeiting. At a certain level, none of this will come as a surprise. Companies lobby for their position and what made the Conference Board of Canada series of events so unusual was the way in which it was exposed. Yet the Conference Board of Canada's recalled reports were clearly just a part of a much larger strategy to influence Canadian copyright policy by creating a narrative of crisis and the false impression of Canada as a piracy haven. This week's comments from Industry Minister Tony Clement and Canadian Heritage Minister James Moore provide the strong sense that they better understand the current dynamic around copyright, but it is obvious that the lobbying on the issue is only going to intensify in the months ahead.